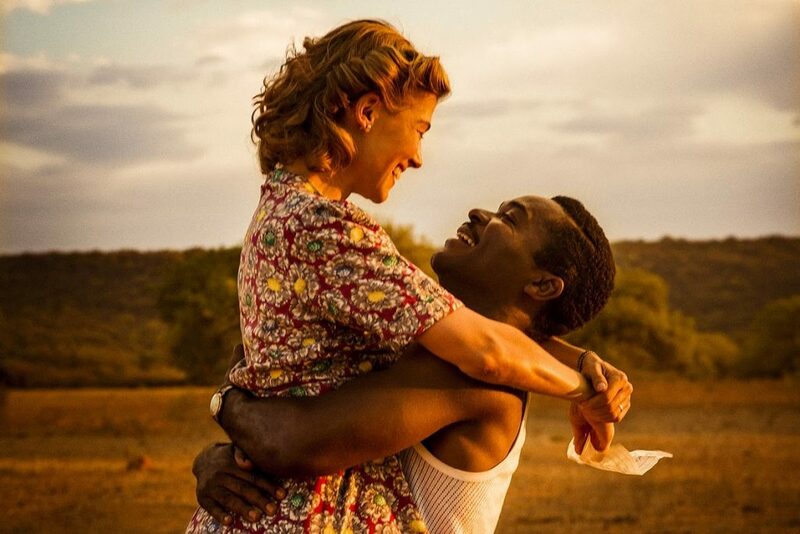 Set in the late 1940s London and the country of Botswana (formerly the British Protectorate of Bechuanaland), A United Kingdom, is a love story in the spirit of Shakespeare’s Romeo and Juliet. Society has many ways to try to separate a couple that crosses the barrier and exemplify love is love. Whether it says you cannot be that person because they are from the wrong family, different caste, or, as in this case, of different races, people of vision for a better world have struggled against Society. Sir Seretse Goitsebeng Maphiri Khama (David Oyelowo), was soon to become King of Botswana when he first laid eyes on Ruth Williams (Rosamund Pike), a white British woman. The love they come to have for each can either cripple the nation of Botswana or be its champion. The symbolism of the closed streets of London, England and the vastness of Botswana is a nice foretelling of the each country’s stance on this “forbidden love.” The feel and color scheme of each also speak volumes. London is cold, rigid, and dark whereas Botswana is warm, fleshy, and bright. Kudos to Amma Asante, the director, the cinematographers, and the design team! The world they presented was real and not overly stylized. Also, another gem of this production was music soundtrack and how music was a common ground for the love birds. I really enjoyed Oyelowo’s performance. He was moving and projected such command over any space he occupied. I did see Oyelowo in The Help, but most likely you remember him as Dr. Martin Luther King in Selma. I recall that as the preacher in The Help, he stood out despite his limited screen time. Pike is about as well known to me as Oyelowo. Gone Girl is why some of you may recognize Pike, but I saw her in Die Another Day as a somewhat skilled villain. I just didn’t believe her work and for the majority of A United Kingdom I still don’t. For a woman to stand up to her family, country, and race, to brave a tumultuous storm that follows her marriage, I just don’t see how she was be so “deer in headlights” timid. I did, however, enjoy her performance as Andromeda in Wrath of the Titans even though I didn’t understand why they changed actresses from Clash to Wrath. Sir Alistair Canning (Jack Davenport) was well done. No matter what Davenport plays in, he goes all out and you believe his characters i.e. the Pirates of the Caribbean films and The Talented Mr. Ripley. Overall A United Kingdom is a splendid tale of love and integrity. We need more tells of other countries’ history. The world needs to hear these stories that were not shared in history class or not accurately shared in some cases. There is plenty to learn from each other. Finally, it is refreshing to see a love story that prizes love above power, position, and monetary gain. This entry was posted on Friday, February 24th, 2017 at 10:51 am	and is filed under Film, News. You can follow any responses to this entry through the RSS 2.0 feed. You can skip to the end and leave a response. Pinging is currently not allowed. Looks like a wonderful film…something I would like to see. A beautiful love story! « Film Review: ‘Get Out’!